Should Children Learn to Swim With or Without Goggles? Using swim goggles allows children to be more relaxed in the water. Thanks for the very intuitive and comprehensive information you provide. Can we discuss swim goggles? While I typically have worn them to prevent that burning red eye syndrome, I would like to hear more of your thoughts about an observation that having children wear goggles (to learn to swim) results in them believing they won’t be able to see in the water without their goggles. 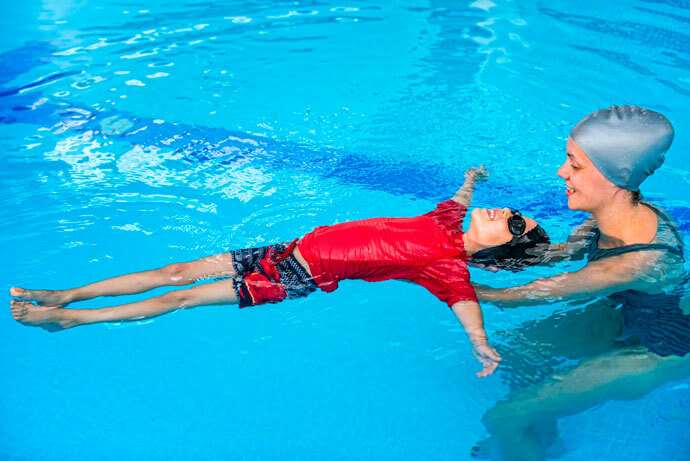 As you know children who swim with their eyes closed often incur collision injuries with other children or walls. Children who fall into the water need to see the way out of the water to survive. I subscribe to the notion to only provide your children with goggles for play or advanced swimming once the child can confidently swim underwater without them. I do see your point. But in my opinion, a child (or an adult) will learn faster using swim goggles. And I think this is what matters. I would also be very surprised that if a child did fall in the water, it would keep its eyes closed. I think the survival instinct would kick in and for the child that would mean looking for a way out with eyes wide open, kicking and flailing with the arms to stay afloat and to move towards the edge/shore, and trying to grab anything within reach. Thinking back about the swimming lessons I had as a child, where we didn’t have swimming goggles, I think I mostly kept my eyes closed under water, and this has held back my swimming abilities a lot. I also remember that sometimes, our swim instructor made us swim with open eyes under water so we would get used to it. It was uncomfortable, but we learned it was possible to see (a bit) underwater and swim. So, to sum up, I would suggest that children learn to swim most of the time with goggles, provided they are available at the correct size so that the children can progress faster. Then from time to time let them swim without goggles so that they experience it is possible to see underwater even though it’s uncomfortable. Learning to swim WITH goggles proved to be a giant mistake. My grandson who just turned 5 years old was taught to swim by his father using goggles about 1 year ago. He confidently swims face down in the water taking breaths every 10 feet or so. He can easily swim to 30 to 40 feet. But without goggles, he will not put his face down into the water. This keeps his body nearly vertical preventing any significant forward progress. So, instead of thinking he could save himself, he would only drown if he fell off a pier, for example. Based on this experience I would introduce goggles ONLY AFTER the child is a confident swimmer without using them. Even if goggles enabled a child to learn to swim somewhat earlier, it does no good if they cannot save themselves without goggles. Thanks for sharing your experience Ed.